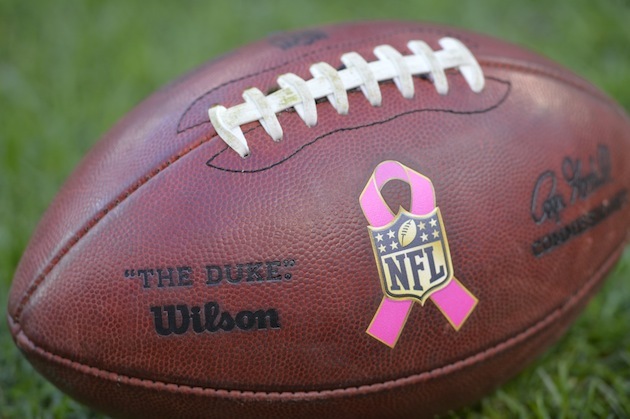 Each October, the NFL paints itself pink in honor of Breast Cancer Awareness Month. But with so little of the merchandise revenue actually going to research, it's worth wondering whether the league's initiatives are more about style—and money—than substance. “But how you are you fighting breast cancer just by wearing pink?” I asked, in as non-confrontational a tone as I could. “We’re raising awareness,” they declared, confident in their answer. As one who abhors “internet activism” — typified by well-intentioned “thoughts and prayers” on Facebook and social change via Twitter hashtags — I was disturbed. Where, I wondered, did my children ever get the idea that simply wearing a color, without taking any other action whatsoever, was equivalent to fighting for a cause? And then it dawned on me: They got it from the NFL. Every October, NFL players, cheerleaders, and fans bedazzle-deck themselves in pink in honor of Breast Cancer Awareness Month. Because nearly all of us know and love someone who has fallen victim to this insidious disease, it’s temping to simply pat the NFL on its head, buy some pink gear, and hop aboard the “fight breast cancer” bandwagon. Then consider that only 71.2% of money the ACS receives goes towards research and cancer programs. After everyone has taken their cut, only 8.01% of money spent on pink NFL merchandise is actually going towards cancer research (emphasis mine). Fair enough. Eight percent of proceeds is better than zero percent, right? And the $1 million plus-per year directed to the ACS as a result of pink-merch sales — money that is ostensibly helping to save lives — is certainly nothing to scoff at. But think of it this way: There are 32 teams in the NFL. If you divide the NFL’s total contribution by the number of teams, you end up with a donation of roughly $31,000 per franchise. To put that in perspective, the NFL fined Marshawn Lynch $100,000 in 2014 for refusing to speak to the media after games. Packers linebacker Clay Matthews was fined more than $17,000 for a single play (more than half of the Packers’ “share” of the NFL’s ACS donation). In other words, the NFL’s gift to ACS is the couch change teams find after cleaning out their stadium suites. Moreover, the NFL’s ACS largess is wildly out of proportion with the pink-festooned celebrations that take place each October at NFL stadiums around the league. 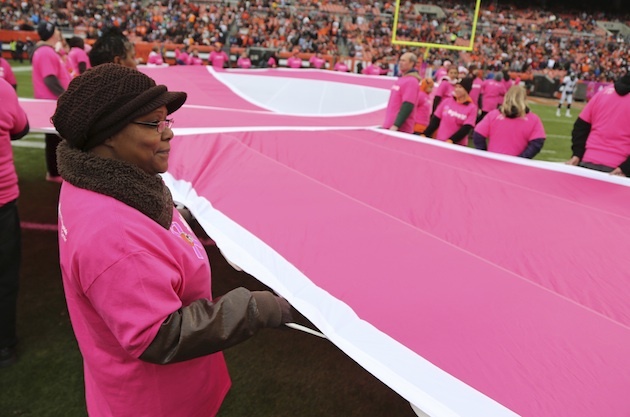 In 2012, 50 breast cancer survivors were honored on the field before a Bills game. A year later, 50 more survivors basked in Gillette Stadium applause. The list goes on. Divide up each team’s share of the NFL’s total donation to ACS by the number of survivors invited on the field, and you're left with a few hundred dollars per person. This is from a league that split $7.3 billion just in national revenue 32 ways a season ago. In other words, the NFL’s donation to ACS is not much more than 1/10,000th of its revenue share pool. And yet, the league continues marketing breast-cancer awareness well into the season. The at-least-it’s-something argument might be somewhat sympathetic if the NFL wasn’t so odious when it came to dealing with, you know, real life people who’ve actually been affected by cancer. Take Steelers running back DeAngelo Williams, who lost his mother, Sandra Hill, to breast cancer in 2014, following a 10-year battle. To his credit, Williams already had a way around the NFL’s arbitrary rule that pink is to be worn only in October. The NFL’s prohibition against non-sanctioned breast-cancer acknowledgement — the idea that any action outside its carefully crafted marketing campaign somehow affects the bottom line — is at best disingenuous, and at worst flagrantly hypocritical. While NFL was busy blasting cancer awareness from every website, TV commercial, pop-up ad and press release, the league fined Williams’s teammate Cam Heyward for wearing eye black (yes, eye black) to honor his father, Craig ‘Ironhead’ Heyward, who died of a brain tumor in 2006 at age 39. The NFL didn’t stand to gain anything from allowing Heyward to honor his father. So they stopped him. It was the “wrong” kind of cancer in the “wrong” month, with Roger Goodell & Co. having nothing to show for it. As it turns out, the money Heyward was making off his “Iron Head” eye black stickers was being donated to the Children’s Hospital of Pittsburgh. That the NFL saw this as some kind of competitor goes to show just how cynical the whole charade has become. Whatever the initial intentions behind the NFL’s foray into breast-cancer charity, it’s clear that October has become nothing more than a slickly designed, tightly controlled, hideously bloated marketing campaign for the the league. Indeed, October is probably the only time that the NFL — which has made several serious missteps in dealing with violence against women over the last two years — finds itself in the good graces of many women. And with women making up 45% of the fan base and influencing 85% of the purchasing decisions, it’s a demographic the league is desperate to retain. So next year, when the pink pom poms are bopping about and more brave breast-cancer survivors are paraded around a field, let’s all take a moment to remember Sandra Hill, Iron Head Heyward, and the countless other football family members who left this earth too soon, and remember their fights — and their lives — were far more special and unique than the factory wares that dare to honor them. Next year, when our TVs turn pink and the NFL takes to patting itself on the back for pitching a quarter into the wishing well, let’s resolve to seek out ways to better channel our support — ones that don’t involve propping up a billion-dollar leviathan. Next year, when the NFL tells us how good and kind and caring it is, let’s not be so gullible.